This is the story of how one little tiny measly fern brought me to the brink of crazy. Okay, let’s be honest, it pushed me over the brink. A fern. Some cars. A little snow (yes from last weekend). One great story. Now I’m just getting ahead of myself. Let me start from the beginning. The day The Boy’s ex-girlfriend saw How to Lose a Guy in Ten Days is the day she bought The Boy a love fern. It was a cute gesture, that combined pop culture (I’ll high five her there) with sass and was a perfect way to symbolize their everlasting love. Which, fortunately for me, didn’t last. And the day I learned this ex-love fern existed was the day I started plotting its demise. Because I’m a girl. And we’re crazy. Don’t lie, you’d do it too. I bribed his roommate to quit watering it when The Boy would take a two week business trip out of town. I accidentally fed it red wine or diet coke when I had a little left over in my glass. This little ex-love fern was on its last leaf. Which led me to the grand idea of surprising him with a replacement love fern. If you just threw up in your mouth, I forgive you, that’s the cheesiest part of the story, I promise. Helpful hint: when attempting to buy something new to replace something that’s held strong for years, the replacement has to be cooler than the original. Cheap plasticy-looking replacement love ferns will not do the trick. They will end up sitting on the table next to the cooler more real deal ferns. Which will really make the replacement look jankety and will inspire no one to get rid of anything. What will get rid of a love fern? Finding out that it has accidentally been over-watered and has been sitting in one large puddle on top of one very fancy dinning room table… all night long. 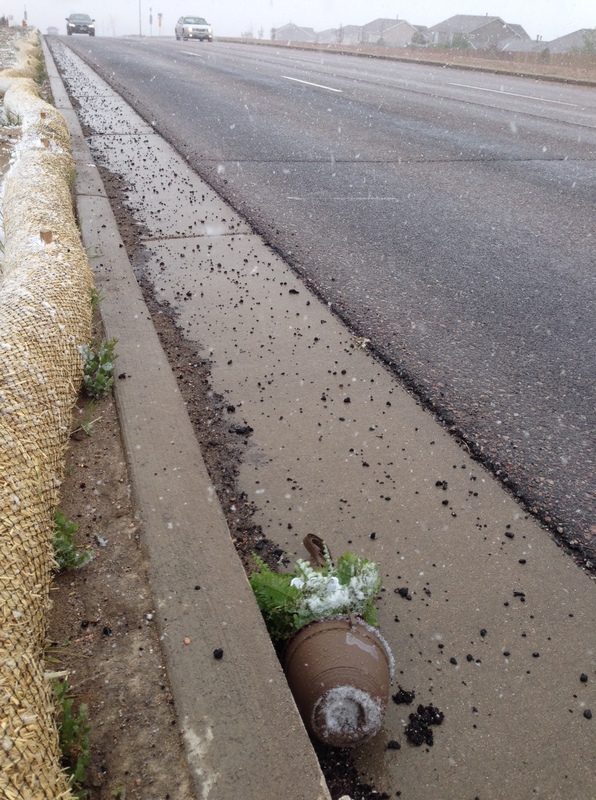 Yes, that’s how the plant ended up in the street. Yes, he chucked it out the back door, clearing 30 feet of back yard and where it landed in the gutter. Yes, there were choice words from The Boy’s mouth in the loudest reaction I’ve seen from him in the last year. It was totally and completely amazing. But it was totally and completely amazing with my love fern. I mean, was I hurt that my love fern was the one accidentally over-watered that got chucked out the door? Sure. Was I unhappy that the ex-love fern was still sitting happily on the living room table? Sure. Was I sad that my plan had failed and I was ready to accept defeat because I’m a rational adult who knows how to control her overemotional girl responses? Man I’d like to say yes. But we all know better. There may have been threats to chuck the ex-love fern out the door myself. Which I think was really just a grown up way to clearly and evenly tempered tell him how much I loathed that other fern and I wanted it to die. Okay, maybe I lied a little. I’m still a totally over reacting crazy woman. Whoops. And when I found out early this week (thanks roommate!) that The Boy had dumped the ex-love fern into the trash was there was rejoicing in all of the lands? Yes. If ‘people everywhere’ can mean just little-old-me? Then yes. You’ll be happy to know that this story has a happy ending. I’ve promised to take him plant shopping, so he’ll be able to water an attractive long lasting plant he really likes that I’ve given him. And not some trashy ex-girlfriend perfectly nice stranger. In summary, this is a story of how a plant drove me into being a total and complete lunatic in the name of love. But really, I think that Kate Hudson would applaud my efforts. In fact, I feel a tribute movie night coming on. And know, if you’ve bought someone a love fern, do the next girl a favor and take that sucker with you. Or leave it and know she’s miserable. There’s a grocery store two blocks away from me that I passionately despise. I know, strong words for something as trivial as a grocery store, but this place is little, run down, always has too many people in line and is the most expensive chain in town. It’s mind-boggling. And true. And I avoid this store at all costs. But on the occasion where you just need a couple of things, it’s hard to justify going out-of-the-way to the nicer stores, like Walmart Grocery… because THE WALMART GROCERY STORE IS NICER THAN THIS PLACE. Deep sigh. Anywho, last night, I just needed to pick up a couple of things on the way to a friend’s house. I tried to psych myself up on the way home from work, while letting the dog out and on that short drive to the grocery store. I got a close spot to the door, I found everything I needed right away (because now I know where they hide things like cheese – hint – NOT in the dairy section) and I quickly made my way to the checkout. And as I was approaching the check out line, there was another guy approaching. I did that quick review to see what he was carrying and to size him up to see if I was going to be able to sneak in front of him all stealth like. Don’t lie, you do it too. Well, this guy was carrying nothing and was in military garb (Army Camo, which I thought was Air Force until I confirmed the pattern on google today. Worst. Citizen. Ever.). Granted, I hate this grocery store and I wanted to get out ASAP, but I’m no jerk, so I let him in front of me like a decent human being. Everyone. 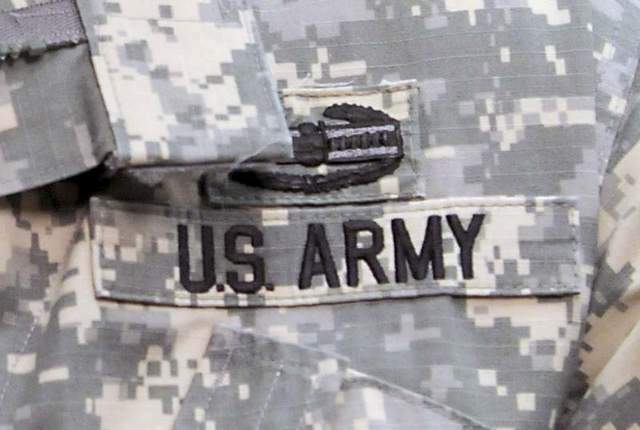 This is what the Army Camo looks like. Apparently it’s been this way since 2013. Take note, in case you ever get quizzed on it in the future. Or if you find yourself living in a military town. Or if you just want to feel like a decent human. And that’s when three small-ish children rush up with a Gatorade in one hand and candy bar in the other. At first I was outraged. Which, is a total over-reaction, but I’m being honest here. Where did these three hooligans come from? Where was this man hiding them? HOW DARE THIS AMAZING SERVICE MAN SNEAKY SNEAK INTO LINE IN FRONT OF ME WITH HIS THREE CHILDREN AND SIX ITEMS! And then these boys started giggling and laughing and teasing each other and their dad. And my grinch heart melted. And it totally reminded me of the times my dad would take my brothers and I to the grocery store and let us pick any flavor of Shasta we wanted. Which, may sound silly, but absolutely meant the world to me. And that memory? Almost made me cry in the grocery store line and made me feel totally compelled to buy this strangers groceries. So, I became a bumbling awkward stranger trying to ask the cashier if I could please pay for his groceries to thank him for the smile, for reminding me of my family that I don’t often get to see and for his service to our country. The cashier was shocked. The man was shocked. I felt super awkward. And then I handed my card over. The cashier runs the card again. I pay for his items. He shakes my hand, says thank you, I thank him again for everything he does for me and then he and those cute little hooligans were out of the store. And I paid for my four items and the sacker looked into my eyes while handing me my bag and thanked me for doing something so nice. I smiled and then ran out of the store (still trying to get over the awkward word vomit and the whole ‘my card got fake declined’ thing) and I climbed into my car in my great parking spot. I just made a strangers day a little better… and most definitely weirder. I shocked someone who stands at a counter and sees the same boring groceries roll by her face all day long. I touched someone who hands people bagged groceries thanklessly all day long. Don’t be afraid to be weird and do something nice today. And if you have cash on you, it might be for the best. I worked at bank right after college, because I’m a total nerd and I majored in Finance. It was an incredible job. I learned a ton about the small professional things everyone should know (I mean, how does one go about scheduling things in Outlook? ), met some incredible friends and mentors but also just learned how on earth you actually dress/act/live as a young professional. None of this is anywhere near the point of this blog post (as you can probably tell by the title)… It’s all just there to describe to you how abouts I got to meet this incredible, bubbly, hilarious girl that I so wanted to be friends with… and how I started going to concerts. There’s a couple of different types of people… the type that go to the weird little concerts and random small venues… and people that just don’t. I fell into the latter category until I met Teresa. If you wanted adventure, T was the perfect friend. We laughed, we tried new restaurants, shops, places… and we went to concerts. Basically, she taught me the art of saying ‘YES’ to random things. And to random concerts. Do you know the artist? Does it matter? No. Just go. Thanks T.
So! 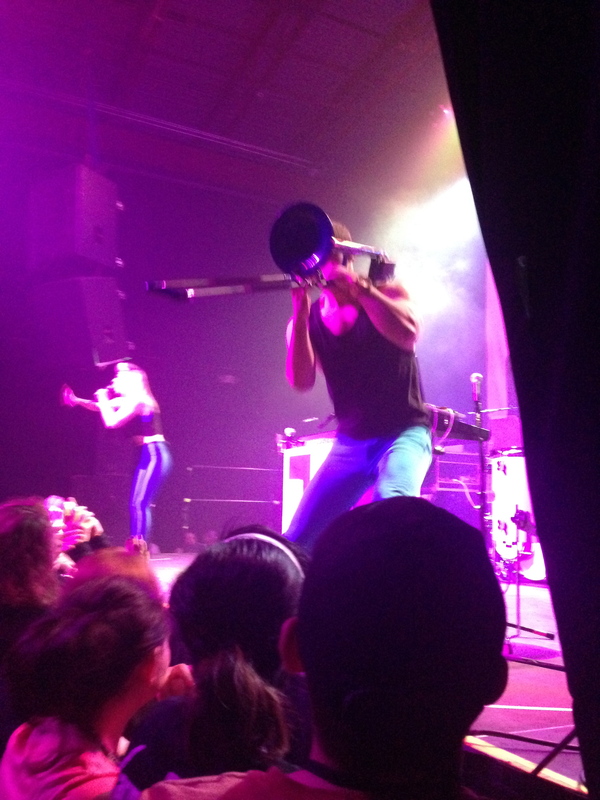 A few weeks ago, a new friend posted on the interwebs about wanting to see Karmin while they were in Denver (Don’t know who they are? Let me just show you…or maybe this?! You’re welcome.). Well, I love Karmin. So I said yes. And it was the best. I’d totally forgotten how much I love random 200 people concerts. Because those artists are the ones that are giving it their EVERYTHING for the people that are paying them to do what they love. Which is absolutely where this group is. I mean, the guy ran around the stage playing the trombone. And she raps. Come on. That’s just cool. Anywho, so new friend and I adventured up together. Early. We waited in line. It was freezing cold. We didn’t have coats. It was just an awesome night. It was cold. 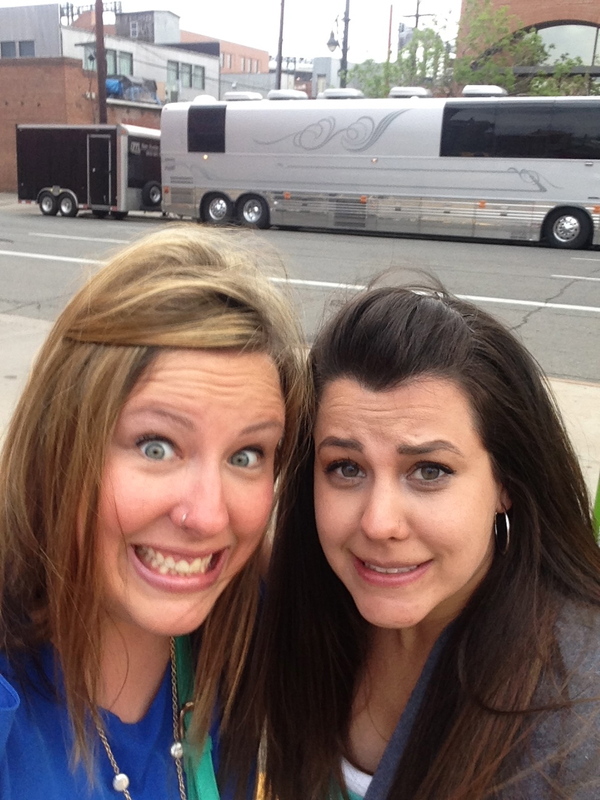 And possible that we were standing in front of THEIR tour bus. So, I don’t know if we were excited/nervous/cold based on our faces. It’s possible it’s all three. And we didn’t get home until much to late for a nearly thirty year old and a mom (her, not me, this is not an announcement) to be out on a school night. A trombone! How is he so talented? And how does anyone look that good in high-waisted spandex pants while sporting a cropped top? They are amazing. But it was awesome, super inexpensive, hilarious, fun and we stood so close. Which, is just always delightful. And I made a new good friend… because 3 hours in the car together, a dinner at McDonalds (don’t you judge me) and four hours of standing on your feet will really do that to people. So thank you T for making me the person that says ‘Yes!’ to random concert adventures. Thanks Whit for letting me tag along. And thank you Karmin for ROCKING it. Now, go buy some concert tickets to a random small venue near you. You won’t regret it. Bonus note (and to complete the blog title): If you’ll notice… I switched my nose piercing to an actual nose ring. I felt like I had to try it at least for a little while and an artsy concert just felt like the right place. Why is this a bonus note? Oh, because when The Boy saw me rocking it with it in for the first time he made up a little jingle and started singing it to me… and it went like this… “If you like it then you SHOULDN’T put a ring in it.” Yes. I died laughing. Yes. It just encourages me to keep it in longer. That boy.